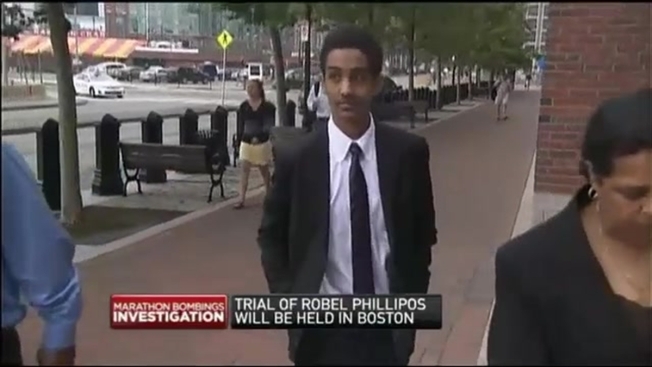 On Tuesday, the Robel Phillipos was not present at his pretrial hearing when the judge swiftly denied the defense motion filed Monday asking the court to change the venue of his trial to Springfield, Massachusetts, Providence, Rhode Island, or Portland, Maine. It was the second time Phillipos' defense had requested a change of venue and the judge essentially chastised them for asking again, especially on what he called "the eve of the trial." Phillipos' defense attorneys argued pretrial publicity makes it impossible for Phillipos to receive a fair trial, but the judge cited the trial of his co-defendant, Azamat Tazhayakov, and said they were able to impanel a fair and impartial jury with far fewer jurors than they originally anticipated. Tazhayakov was found guilty of obstruction of justice and conspiracy for taking a backpack and laptop from marathon bombing suspect Dzhokhar Tsarnaev's dorm room. He faces up to 25 years in prison when he is sentenced next month. Another co-defendant, Dias Kadyrbayev, pleaded guilty to similar charges and faces up to seven years in prison when sentenced. Phillipos is charged with lying to investigators about being in Tsarnaev's dorm room. The defense denies he was there. Phillipos's trial is scheduled to begin next Monday, Sept. 29 with jury selection.Opening arguments are scheduled for October 6. The prosecution anticipates its case-in-chief to last about one week.